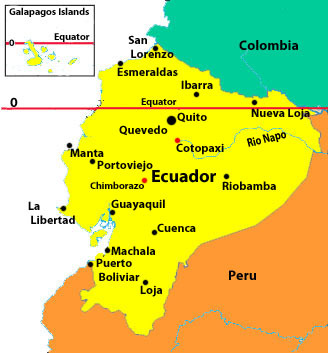 Ecuador, with the equator running through the country thus giving its name, is located on the northwestern corner of South America and is bordered by Colombia to the north, Peru to the east and south and to the west is the Pacific Ocean. The Galapagos Islands which lie 600 miles to the west in the Pacific Ocean are also a part of Ecuador. Travelers to Ecuador experience a large diversity in landscape as well as culture, from the hot and steamy jungles of the Amazon, snow covered mountains of the Andes to the Pacific coastline. Ecuador being on the equator sees little change in daylight hours thus giving what many call an eternal spring time, Ecuador is made up of 24 Provinces and has 3 main geographical regions, La Costa, La Sierra, and El Oriente and then there is the insular region of the Galapagos Islands in the Pacific. La Costa, the Pacific coastline running from Colombia in the north to Peru in the south is a region made up of low lying land; spectacular beaches give way to large shrimp farms and banana groves. The port city of Guayaquil, with over 2 million people and Ecuador’s largest city, is located in La Costa region. The climate of La Costa is tropical with a heavy rainy season. La Sierra, snow capped mountains and volcanos of the Andes mountain range run north to south through the center of Ecuador is home to the Quito, the capital of Ecuador. Quito with 1.4 million people is located at an altitude of 9350 feet. The climate of La Sierra is dry and temperate. El Oriente, located in the eastern portion of Ecuador, the region is made up of the Amazon rain forest. With the area of El Oriente making up almost half of the land mass of Ecuador, the population is only 5 % of the total country. The climate of El Oriente is hot, sticky with large amounts of rain through out the year. Galapagos Islands, taking its name from the large Giant Land Tortoises that roam the islands are located almost 600 miles to the west of Ecuador’s Pacific Coastline, the Archipelago of islands cover an area of over 28,000 square miles. Made up of 16 main islands and 6 smaller islands, the Galapagos are known for its vast number of unique animals and was made famous by Charles Darwin and his studies on evolution. Ecuador exports oil from its vast oil reserves of the Amazon region as well as being the world’s largest exporter of bananas, flowers and shrimp also make up a large part of the economy. Ecuador was once part of the large Inca Empire with the local population almost being wiped out by disease during the Spanish conquistador’s advancement throughout South America. Today the population of Ecuador is mainly made up of Mestizos, 62% of the population, who are descendants of indigenous Indians and Spanish colonists. Ecuador’s strong ties and long history with Spain, has had a influence on the country, the main religion is Roman Catholic and the official language is Spanish.